Cheapeats, Inc. Blog » Looking For Sushi In Staten Island? Looking For Sushi In Staten Island? One of the complaints of many Staten Islanders, is that they’re the forgotten borough. So when Cheapeats received a generous invitation to sample a restaurant “On The House,” and has a location in Staten Island….we took them up on it. We decided to take a Staten Islander with us and headed over to Fushimi. 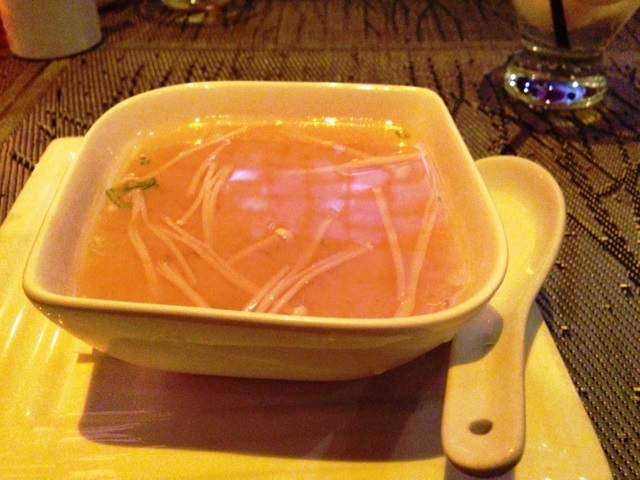 Fushimi is a modern Japanese restaurant and lounge, with locations in Staten Island, Williamsburg and Bay Ridge. Because we heard your cries, we decided to check out their Staten Island location at 2110 Richmond Road. Even though our meal was comped, the challenge was, is it Cheapeats? We came packed with our appetite and calculator, to see if it meets the challenge. The interior is black and white modern, with their dining on the left and their bar/lounge on the right. Side note, the lounge was HOPPING!!. We came to eat, so to the left please. Our lovely server handed us our menus and took our drink orders (not included in the calculation). As I glanced over the menu, my creative juices were flowing, to make this a meal $25 and under. $18 Bento Box, that would do it, but then something caught my eye. 4 course prix-fixe menu for $27. Ding! Ding! Ding! We have a winner. Our first course was Miso Soup. 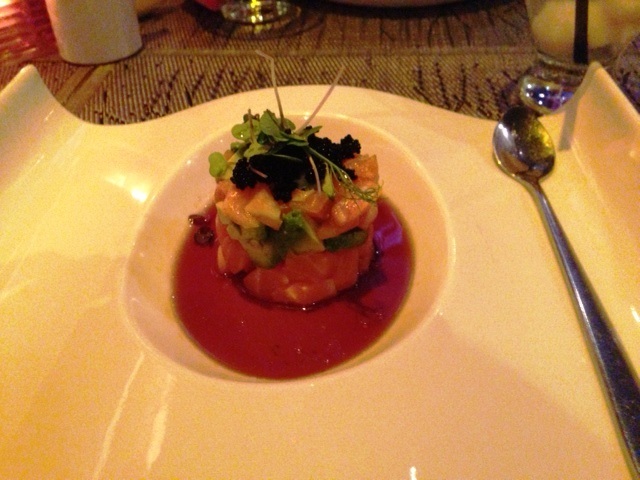 But not just any Miso Soup….LOBSTER MISO SOUP. This light and steamy soup was filled with Enoki Mushrooms, Scallions, Tofu and chunks of Lobsta (to be said in a Staten Island accent). The saltiness of the Miso, with the sweetness of the Lobster, was the perfect combination of salt and sweet. Mmmmm. For our next course, my taster went with a green salad, but I chose Tuna Tartare. When the beautiful wavy white plate was set down in front of me, I gasped. “What a work of art.” Buttery Ahi grade Tuna topped with a layer of creamy Avocado and micro greens. It was sitting in a sauce that was again, salty and sweet. When you put the whole thing together, to formulate the perfect bite, one word; PERFECTION! Then came the entrees. My fellow taster can’t do the raw fish thing, so she went with a buttery steak. I chose the Sushi Platter which was an assortment of rolls and Sashimi. 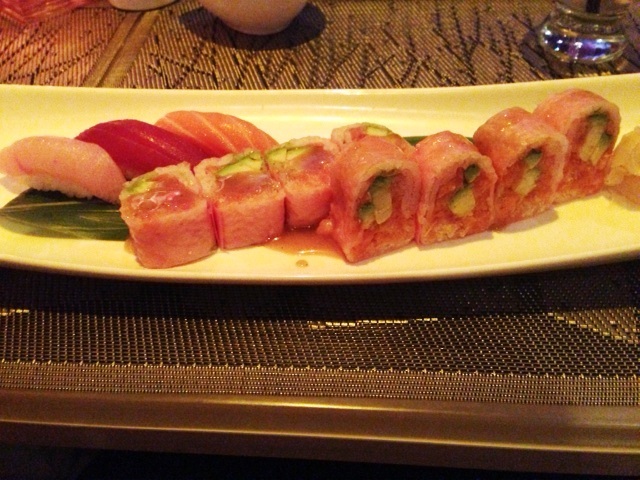 Tuna, Salmon and Yellowtail….Oh My. Everything was so fresh and melted in my mouth. For dessert, I ordered the Lava Chocolate Cake and my taster chose the deep fried ice cream. Where are the pix you ask? I’m embarrassed to say we devoured them before I could get a shot in. This entry was posted by Rosemarie on Monday, September 23rd, 2013 at 5:52 pm	and is filed under Asian, Japanese/Sushi, Staten Island. You can follow any responses to this entry through the RSS 2.0 feed. You can leave a response, or trackback from your own site.